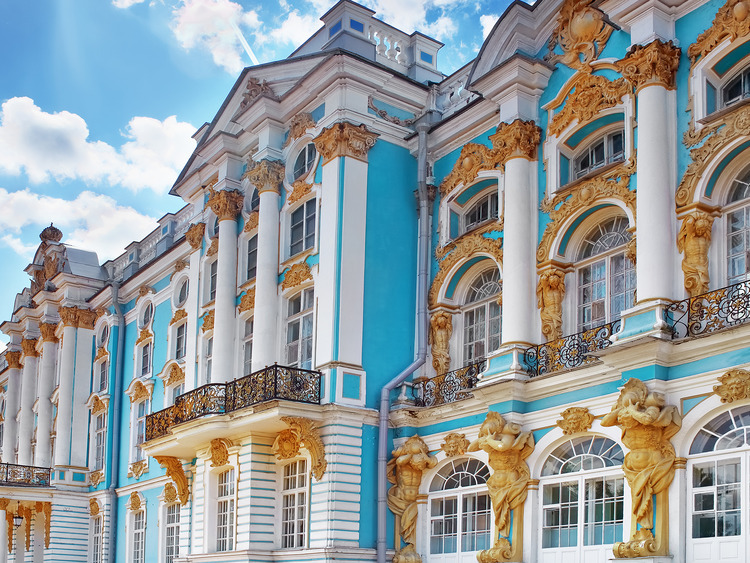 We will set off towards Pushkin, a town known in the past as Tsarskoe Selo (Tsar's Village), where the wonderful Catherine Palace awaits us. Commissioned by Peter the Great for his wife Catherine in 1710, this estate was used as the imperial family's summer residence until the period of the last Tsar. Inside the palace, we will be amazed by the rooms and galleries decorated with period furniture, candelabra and paintings. Most striking of all is the famous Amber Room, once considered the eighth wonder of the world, with walls covered entirely in amber panels with gold leaf decorations and mirrors. Plundered by the Nazis during the Second World War, it was rebuilt piece by piece in 2003 by expert Russian artisans. We will end our visit to the palace with a walk in its well-kept gardens. After lunch, our tour will continue with a cruise along the Neva river. St. Petersburg is often called "the Venice of the North" as the city was developed over 42 islands and more than 62 small streams and canals cross it in all directions. Whilst on board our boat and the coloured domes and fairy-tale buildings bewitch us with their reflections twinkling on the water, our guide will tell us stories and legends about the noble families that once owned the buildings on the riverbank. We will pass the granite walls of the Peter and Paul Fortress and the golden spires of the majestic Saint Peter and Paul Cathedral, whilst, in the distance, we can make out the onion domes of Smolny Cathedral. The memory of the fabulous views that appear before our eyes at every turn along the river will keep our minds occupied whilst we return to the ship. It is not permitted to use cameras inside the Amber Room. The price of the excursion includes tickets to use cameras and/or video cameras inside the palace. Headsets are included in the tour.